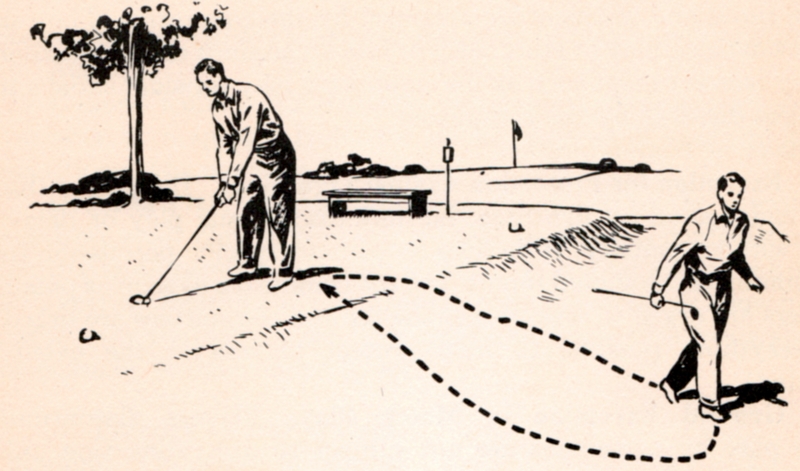 The penalty for losing a ball or hitting it out of bounds is “stroke and distance”: if your first shot vanishes or ends up on the wrong side of the white stakes, you count that stroke (one), add a penalty stroke (two), and hit again from the original spot (three). 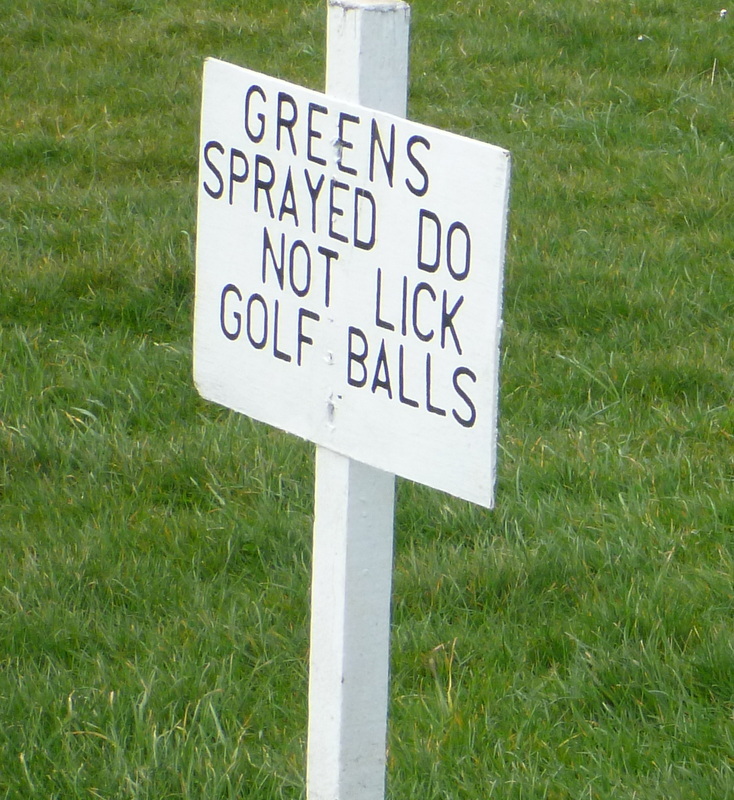 Many average golfers either don’t understand that rule or refuse to observe it. They “drop one” on the course near the spot where they figure their first shot disappeared, add a stroke, and play from there. Stroke and distance was part of golf’s original list of rules, in 1744, but during subsequent decades and centuries it was repeatedly modified, dropped, resurrected, and modified again. 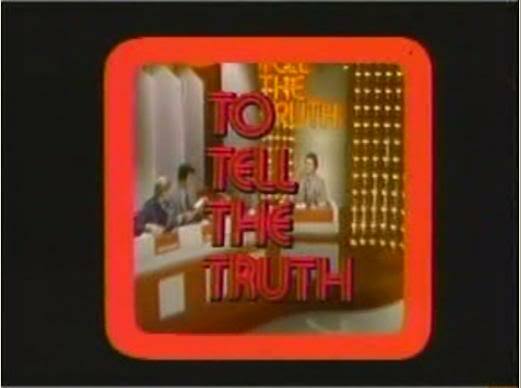 Sometimes you counted only the bad stroke and the do-over; sometimes you added a penalty but got a drop. 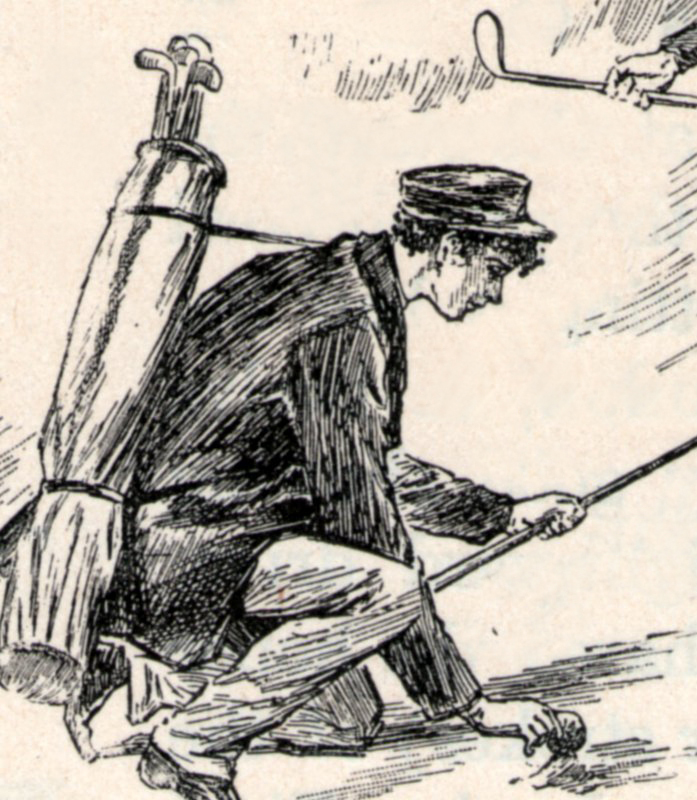 The most severe version was adopted by the Royal & Ancient Golf Club of St. Andrews in 1842: three strokes and distance, meaning that if you hit a ball out of bounds your next stroke, played from the spot where you struck your first, counted as your fifth. That lasted until 1846. 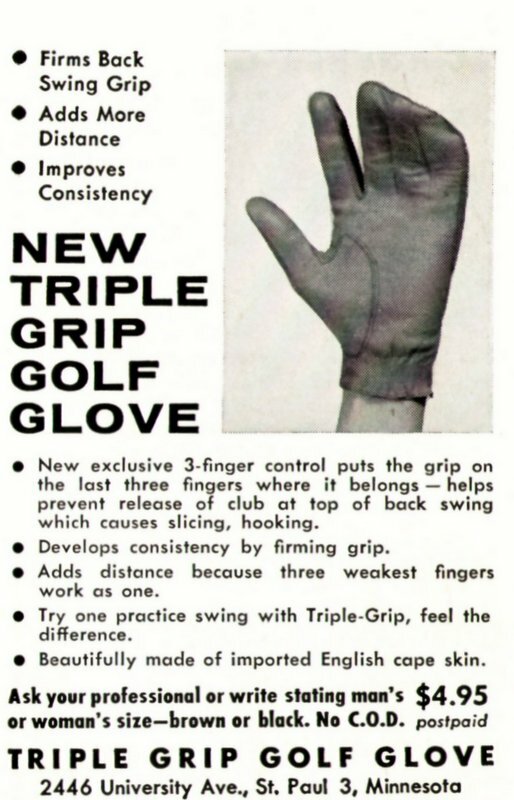 In 1951, the R & A and the USGA agreed to apply the single-stroke-and-distance penalty universally. 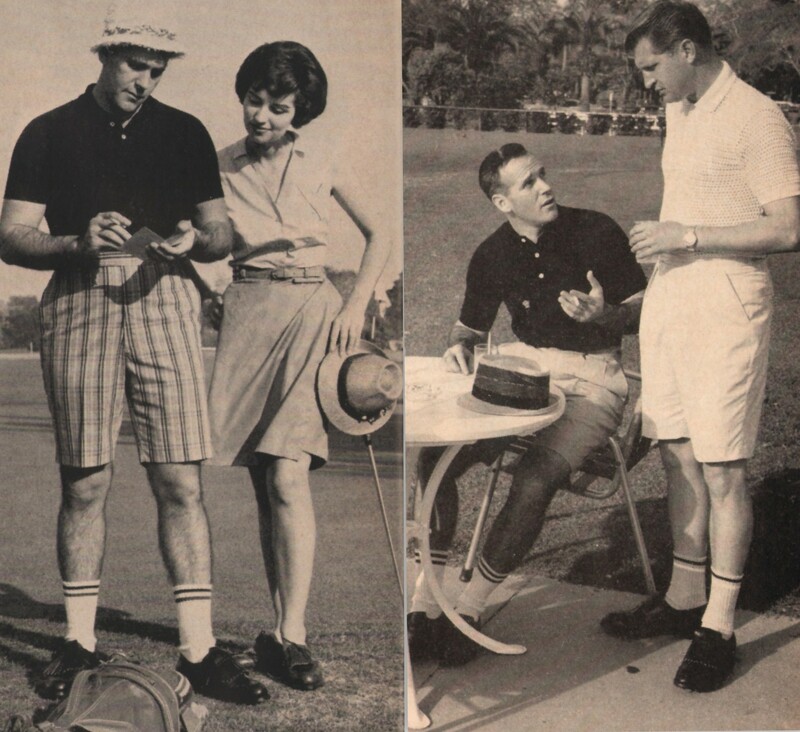 But there was still plenty of grumbling, and in 1959 the Southern California Golf Association, with the support of 90 per cent of its members, adopted a local rule eliminating what it described as the “unfair penalty stroke in connection with ball out of bounds, lost ball and unplayable lie.” Thenceforth, in Southern California, if you did something stupid the assessment was “stroke only.” You counted the bad shot and the replay (from the original spot), but nothing in between. 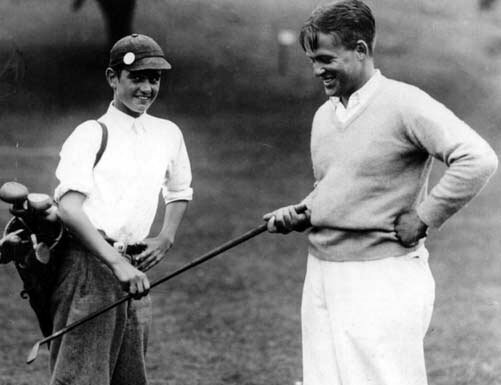 The USGA relented for a year, in 1960, but the stroke-only faction ultimately lost out, and the current rule, with minor tinkering, has been in place all over the world since 1968. But who knows? 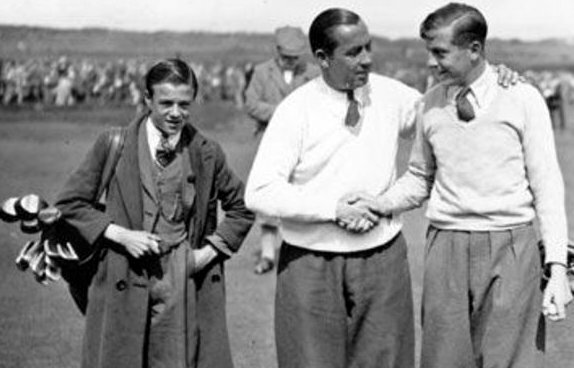 Maybe the governing bodies will come around to Sarazen’s point of view. 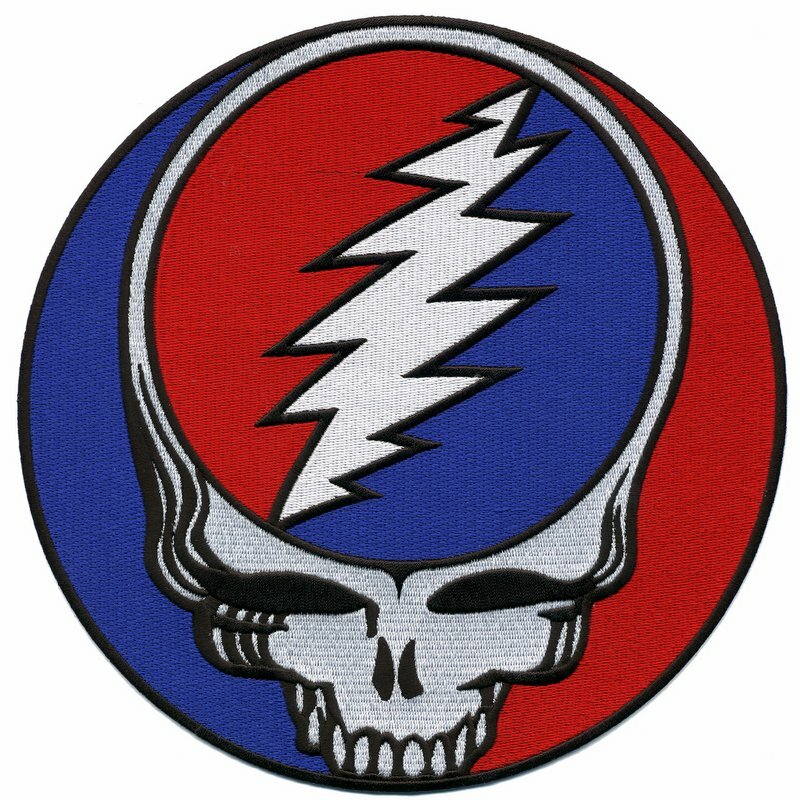 My favorite headcover was made of black plush and had the Grateful Dead’s red-white-and-blue “Steal Your Face” skull logo embroidered on it. I got to play golf with Jim Furyk once, and before we teed off his caddie, Fluff Cowan, looked into my bag and said, “So, you’re a fan of the boys, eh?”—one of my proudest moments in the game. 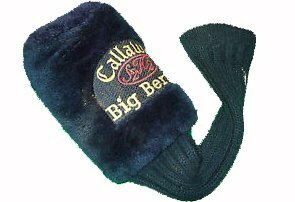 My 5-wood eventually wore a hole through the fabric, and I had to take that headcover out of service. 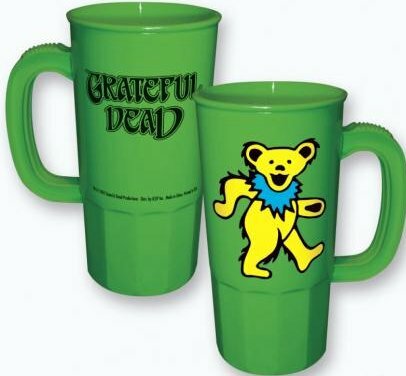 The huge online store on the Dead’s official website used to have lots of branded golf stuff, but not anymore. Those two transactions bracketed the beginning of the modern headcover era. Today, it’s impossible to buy a wood or even a hybrid without also receiving a complicated sheath that appears to have been manufactured in the same Chinese factory that makes shoes for NBA players and props for George Lucas movies. Someone I played golf with once told me that getting rid of headcovers would speed up the game by twenty minutes a round, and I believe it. Putting a modern headcover back onto a modern driver can be as exasperating and time-consuming as putting a snowsuit onto a toddler. 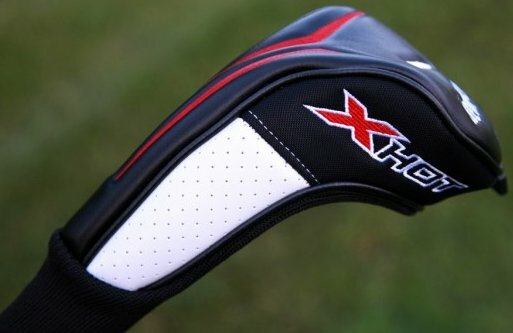 Using headcovers on irons is still for beginners only, like using a clicker to count shots or carrying tees in a bandolier. And thank goodness for that. But who knows? A lot of people didn’t think that soft spikes would catch on, either. Your loved ones have a hard time buying presents for you, so you try to help: “How about some of my favorite golf balls?” You write down the name of the kind you like—the exact name, including the “X” after the “V1”—and your loved ones take the piece of paper with them when they go shopping. 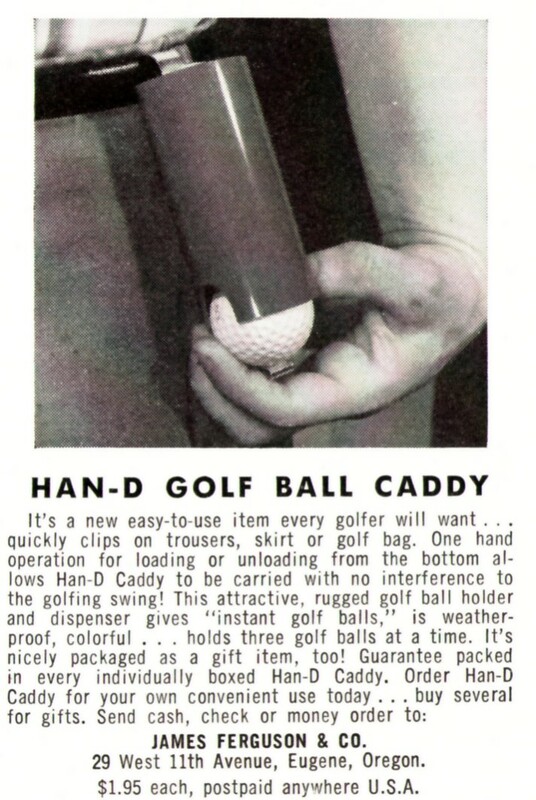 And there, in the ball department of the huge golf store at the mall, they see the kind you want. But, holy cow, those balls cost almost fifty dollars a dozen! That’s, like, four bucks a ball! Luckily, though, on a shelf nearby are some identical balls (equally spherical, equally white) that cost only a quarter as much—and they come 18 to the box, instead of just 12! So your loved ones buy you two boxes of those! Three dozen balls for half the price of one dozen! That’s probably enough to last you for the rest of your life! Oh, well. 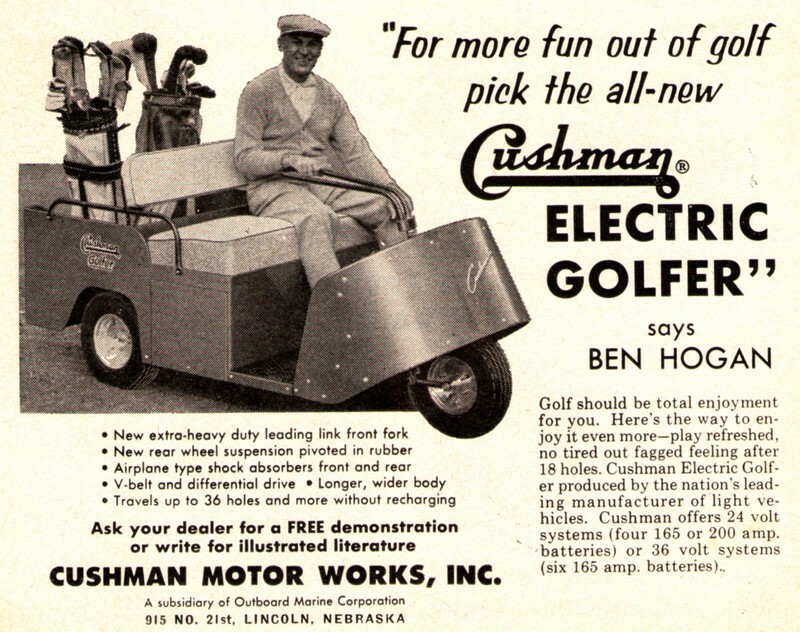 There’s nothing you can do about it, except to hit those balls into the woods with your brand-new approach wedge (which you ordered and wrapped yourself). Am I Related By Marriage to the Inventor of the Golf Rainsuit? My wife’s last name is Hodgman. In 1838, a distant relative of hers—that is to say, a relative not related to her by money—founded the Hodgman Rubber Co., which still sort of exists. In fact, my wife has a Hodgman camo rain jacket (which she never wears). She also has an old box of Hodgman rubber bands, and she claims that the company was once famous for manufacturing horse condoms. In 1913, Hodgman Rubber published a self-celebratory book, on the occasion of its seventy-fifth birthday. “The orderly business man at his desk is lulled by the harmonious music of the rubber band,” the book’s author wrote; “the eager traveler hastens swiftly on his unwearied way in the glad knowledge that not he but his motor car is rubber tired. Rubber is the main spring of sport in football and in tennis. The urgencies of business are sped by messages over telephones that are rubber wired.” And so forth. 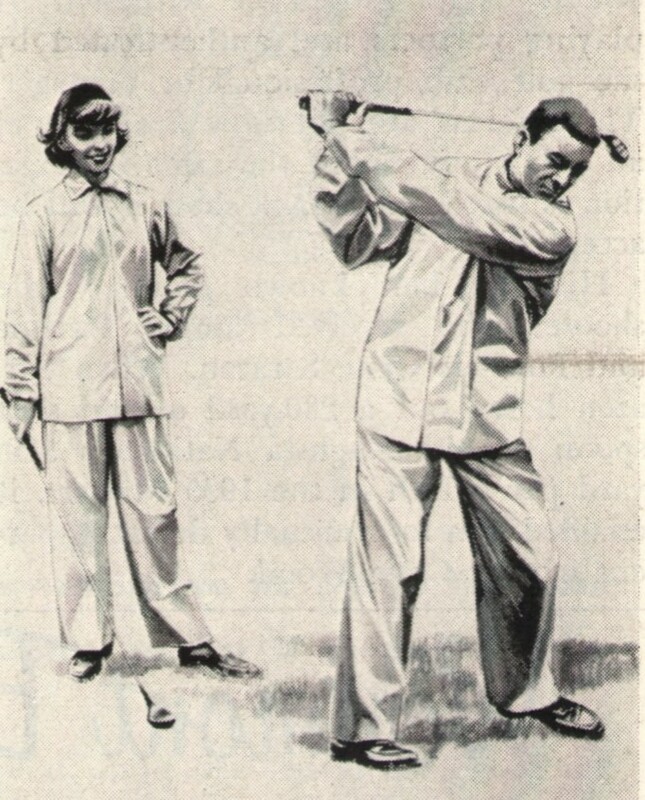 Also, eventually, rainsuits for golfers. 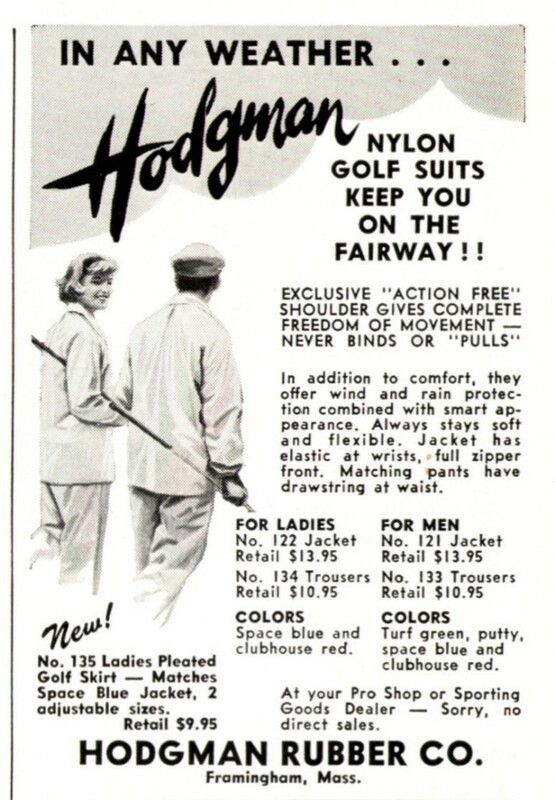 Hodgman rainsuits couldn’t cure a reverse pivot, apparently (see advertisement above). But they did leave plenty of room for unavoidable age-related increases in B.M.I. 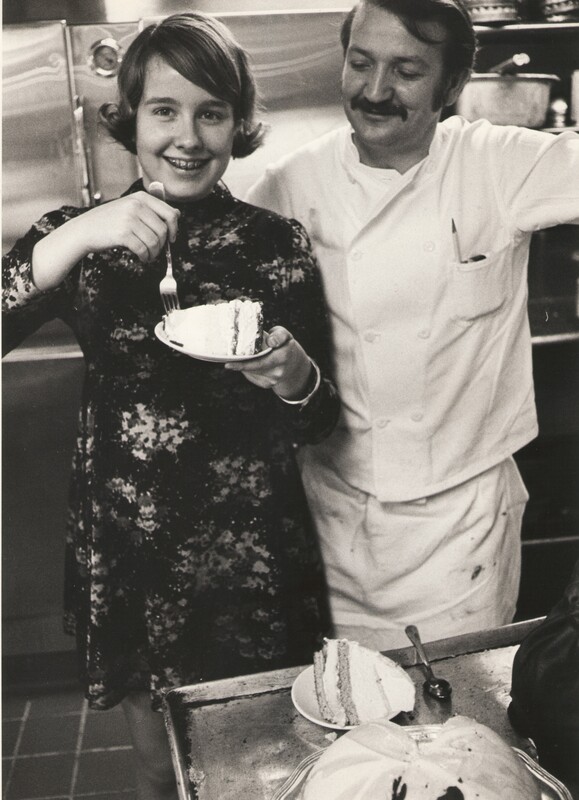 Ann “Distant Relative of Possible Inventor of the Rainsuit” Hodgman and I are currently in Amsterdam, celebrating our thirty-fifth wedding anniversary. There was a little rain here this morning, and when we walked to breakfast I wore a golf rain jacket—which, I’m sorry to report, was not a Hodgman. But, at any rate, it’s not raining now. 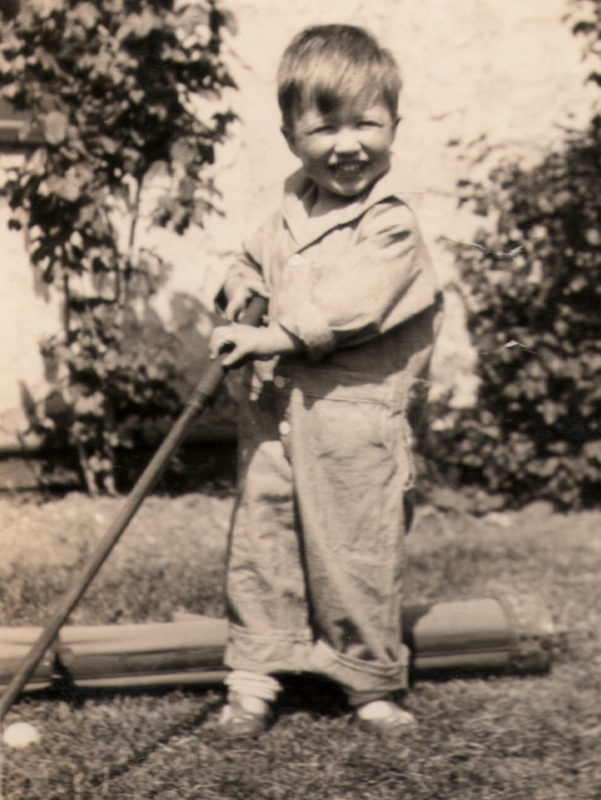 My father trying golf in 1927, with a corner of my grandmother’s rose garden in the background. He was two, and his grip was close to the one he used as an adult. 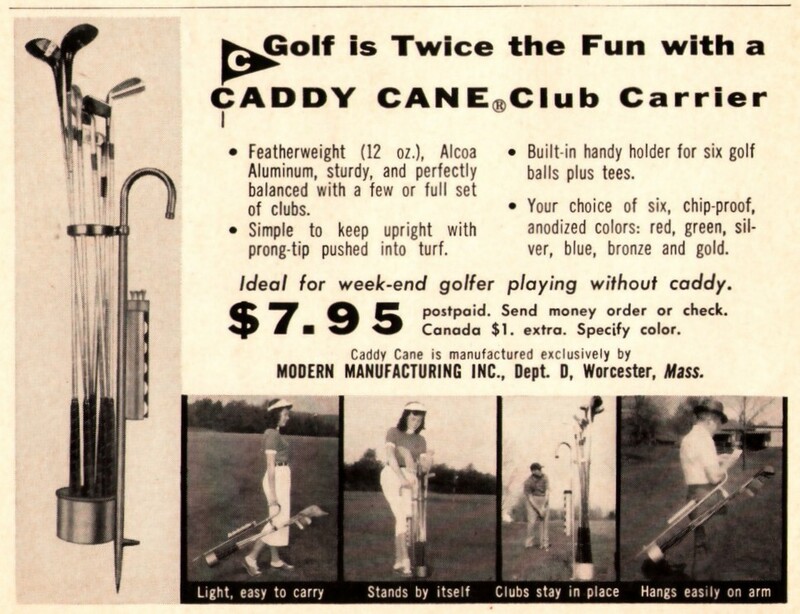 I took up golf in my mid-thirties, and when my brother watched me hit a weak slice with a five-iron, shortly after I’d started playing, he said, “You’re already the second best golfer in the family.” The clubs in the photo belonged to my grandfather, who was a decent player. 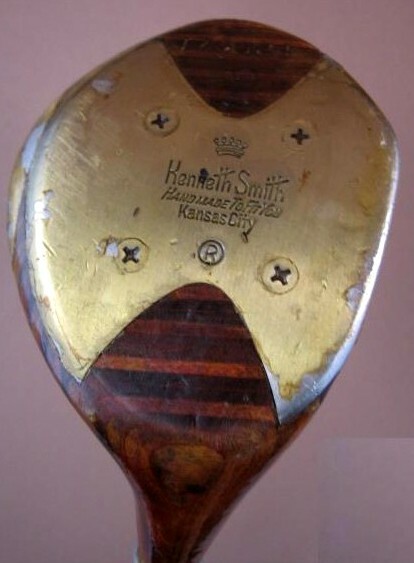 They were custom-made by Kenneth Smith, who was also from Kansas City and hadn’t been making golf clubs for very long. Among the other golfers who played with Kenneth Smiths, eventually, were Bob Hope, Sammy Davis, Jr., Mickey Mantle, Lyndon Johnson, Dwight Eisenhower, and the King of Morocco. 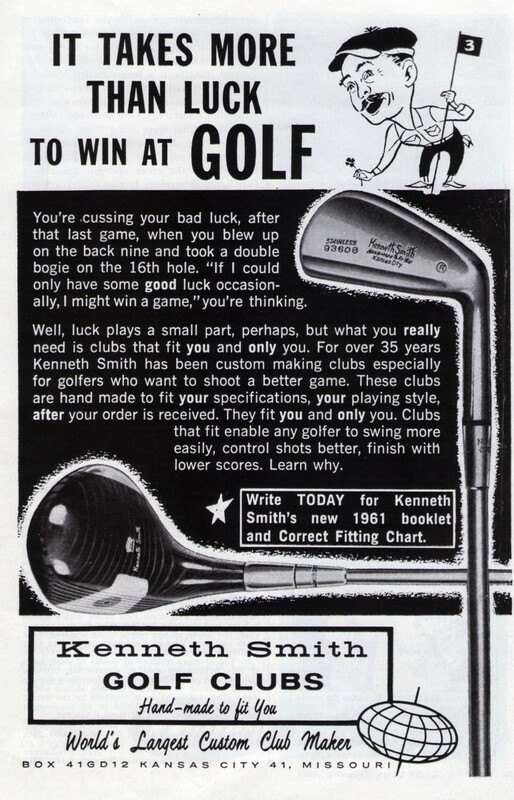 I played golf a little when I was twelve and thirteen, and the driver I carried (which I hated) was a cut-down Kenneth Smith. My father underwent major surgery when he was in his seventies, a few years before he died. The operation lasted for six hours, and he ended up with sixty-one staples in his abdomen. When he finally began to come around, a couple of days later, the doctors had to put restraints on his arms to keep him from inadvertently ripping out various tubes and catheters and monitoring devices. He was on a ventilator for a while, too. It was a rough time for him, and an even rougher one for my mom, who, after all, was conscious through it all. She was at his side when he opened his eyes. The first thing he said, in a voice that was weak but filled with hope, was “Am I at the country club?”—exactly what I would have asked in the same situation. Not many shopping days left. 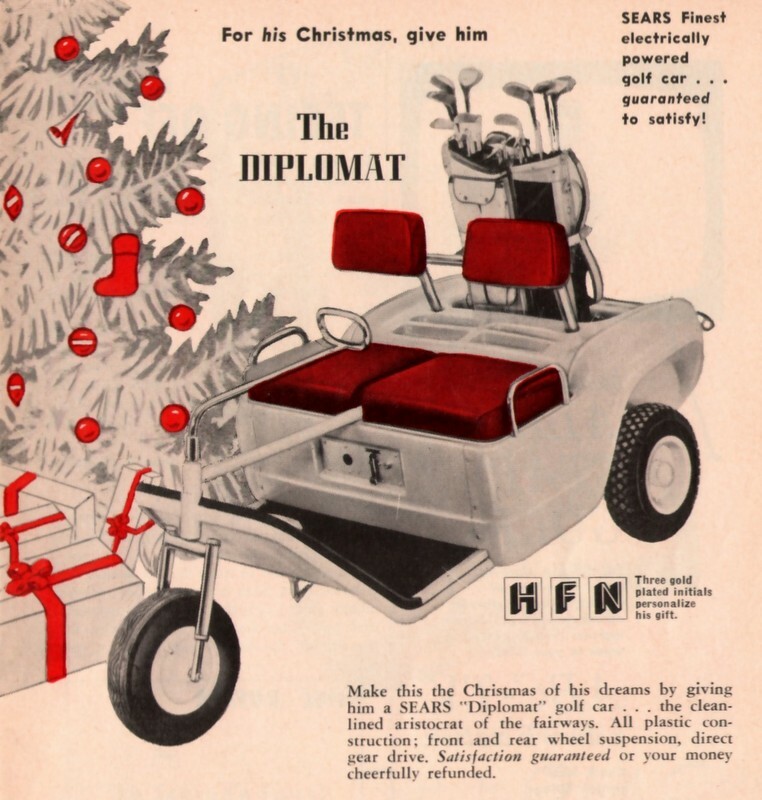 Here are some more gift ideas from the Golf Digest Time Machine. 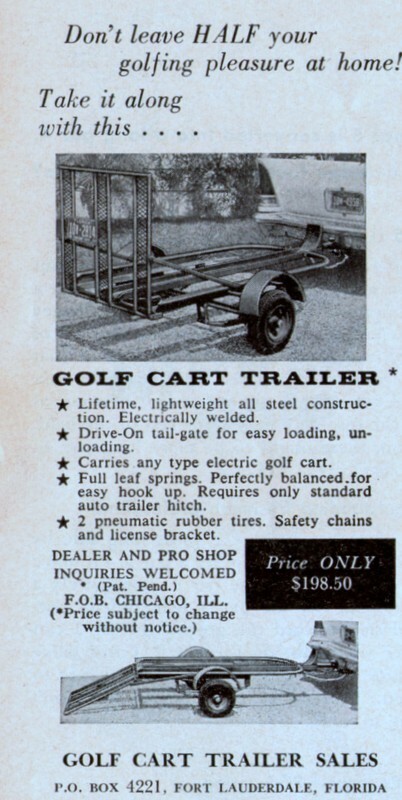 This ad is from almost exactly fifty-five years ago. 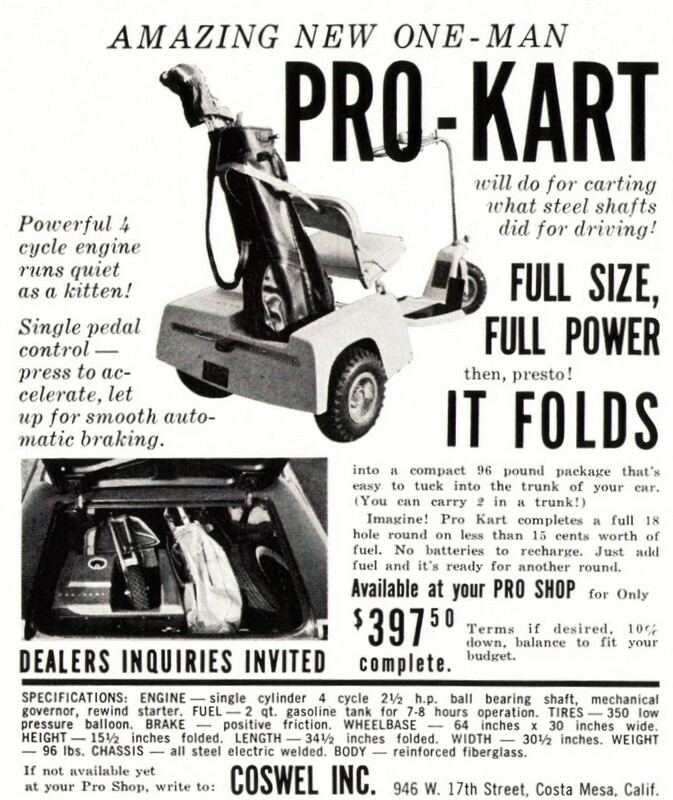 Even then, selling these would have been a slow way to get rich. 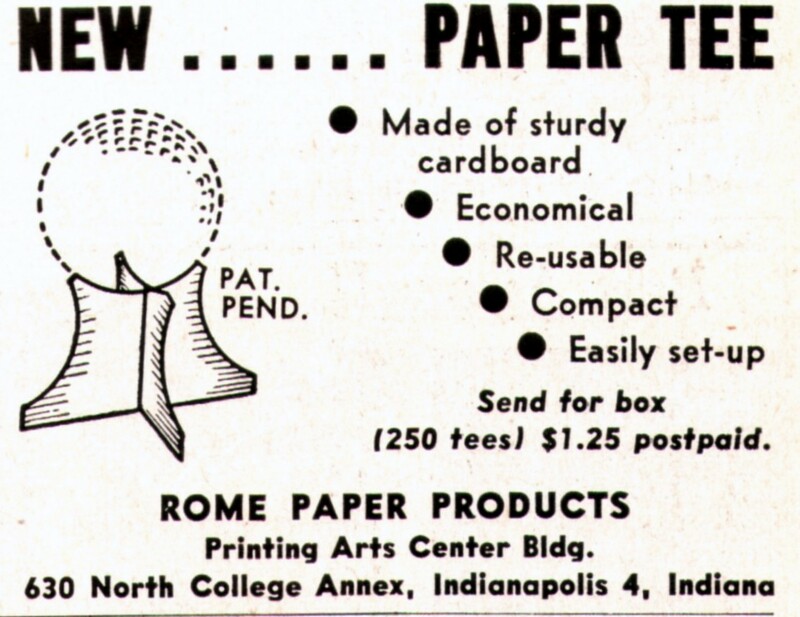 There’s still a Rome Paper Company, although it’s in Georgia, not Indiana. Among its many products: a “germ-shaped stress reliever” (not suitable for children under three). 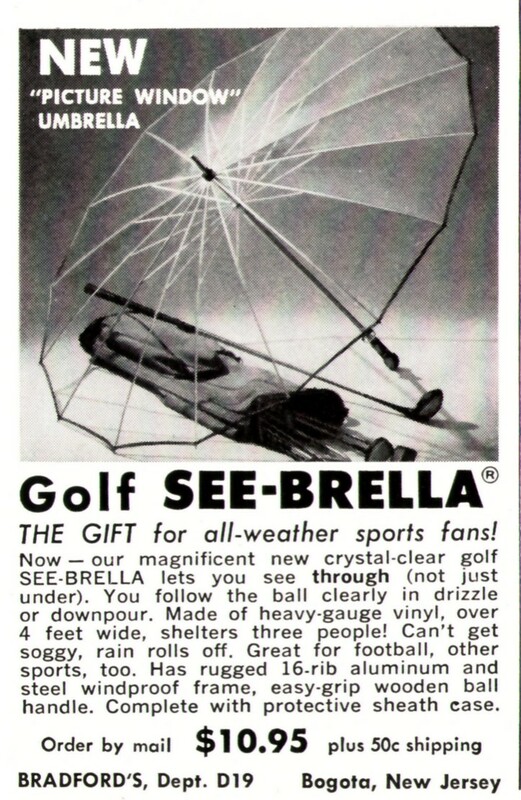 Golf umbrellas, transparent or otherwise, strike me as more trouble than they’re worth, but some people like them. 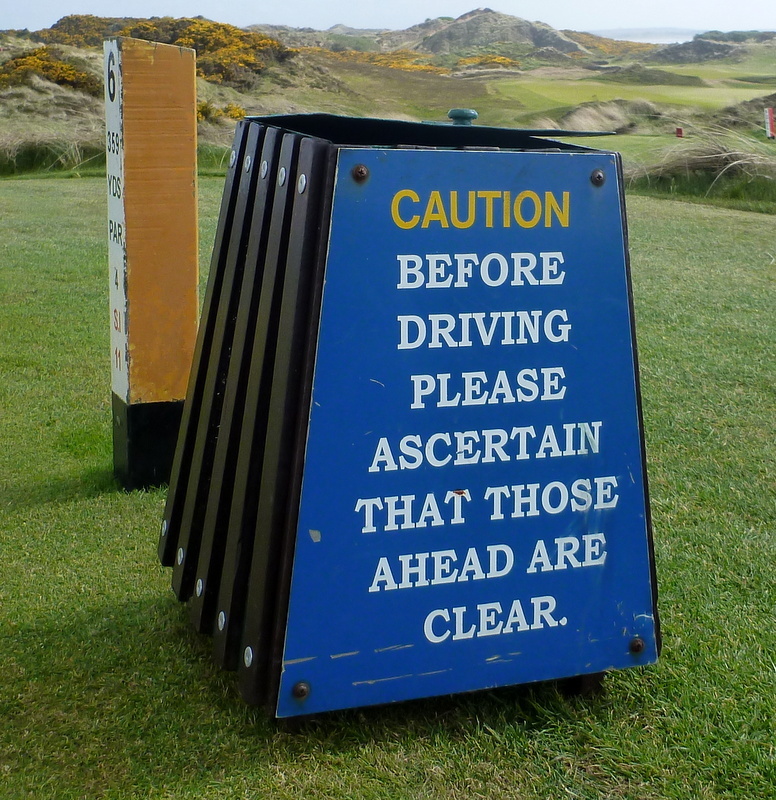 If you forget to take yours on a golf trip to Scotland or Ireland, you can usually find one or two inside-out ones in the trashcan on the second tee of whatever course you’re playing in the rain. 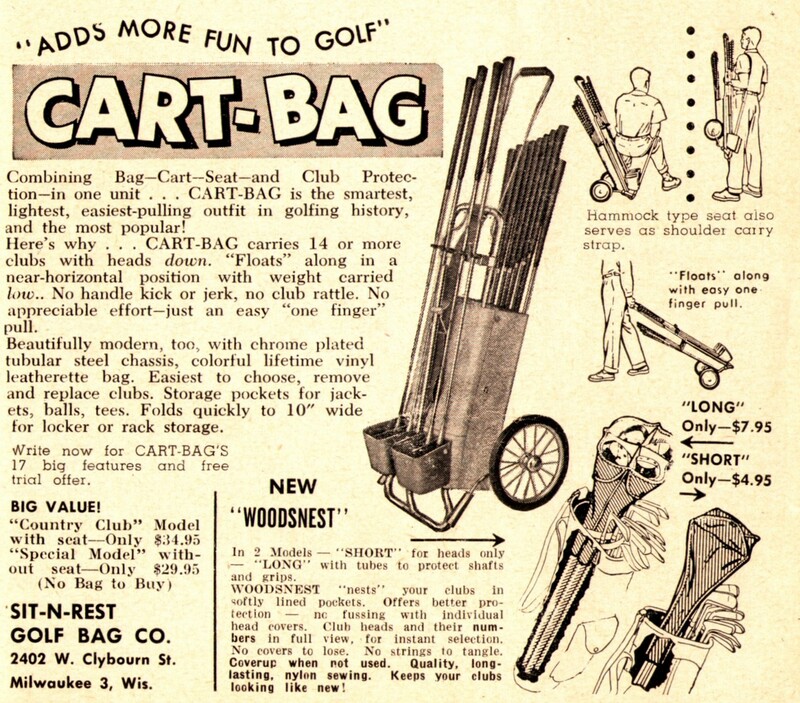 A golf bag that’s also a chair, from 1958. The ad says it’s lightweight, but to me it looks heavy enough to make itself necessary. Could that be Mr. Moreland himself? This is similar to Stanley’s eBay club carrier, though probably more useful as a weapon. 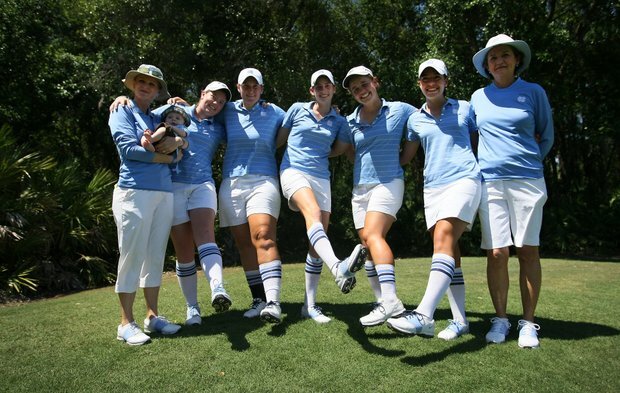 Is that Sam Snead in the photo on the right? 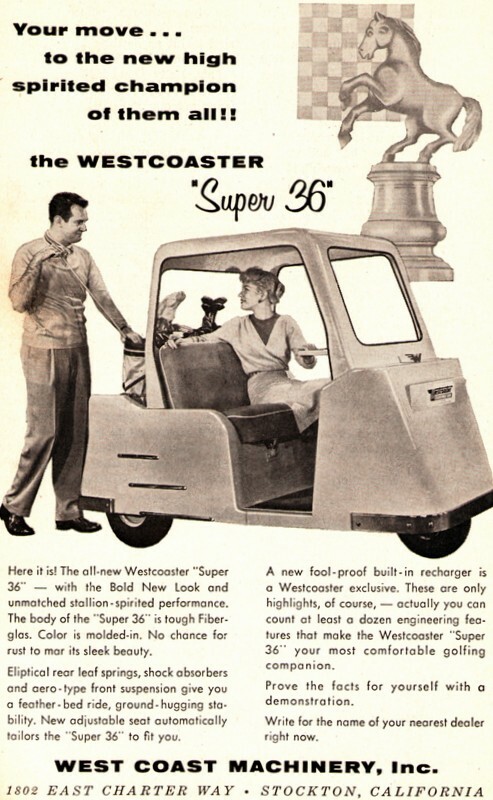 The Sit-n-Rest, from 1959, combines the best (as well as the worst) features of the previous two items. 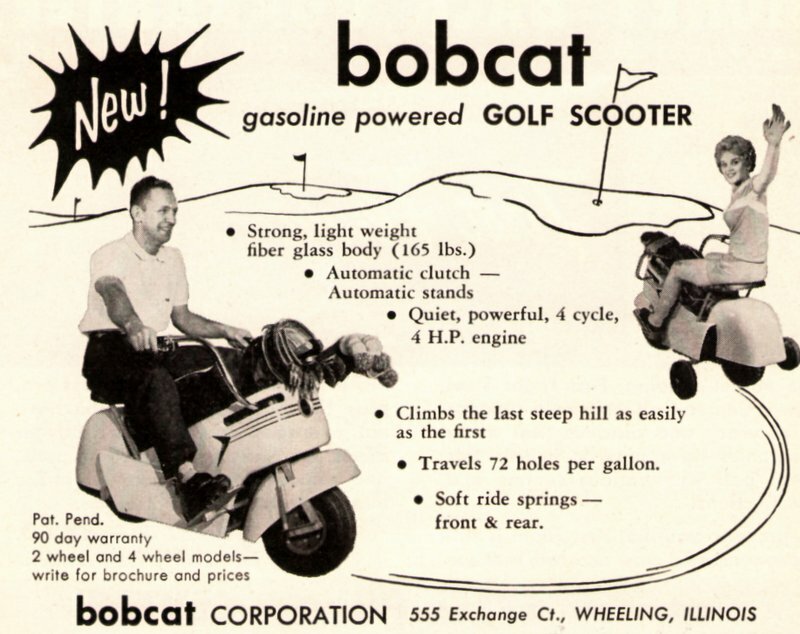 Note the four-club head cover in the bottom right hand corner. Order now! 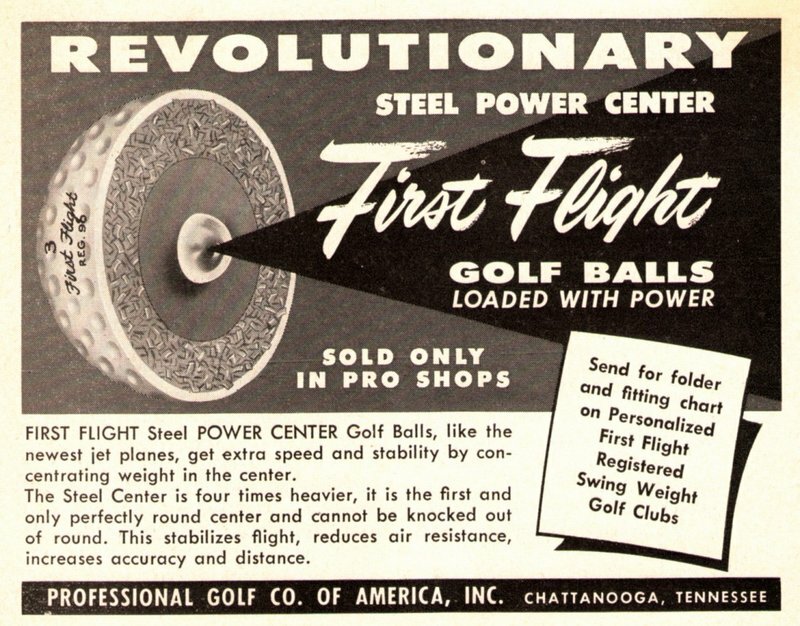 Did the pros really heat their balls in 1961, when this advertisement ran? Whether they did or not, is it legal today? 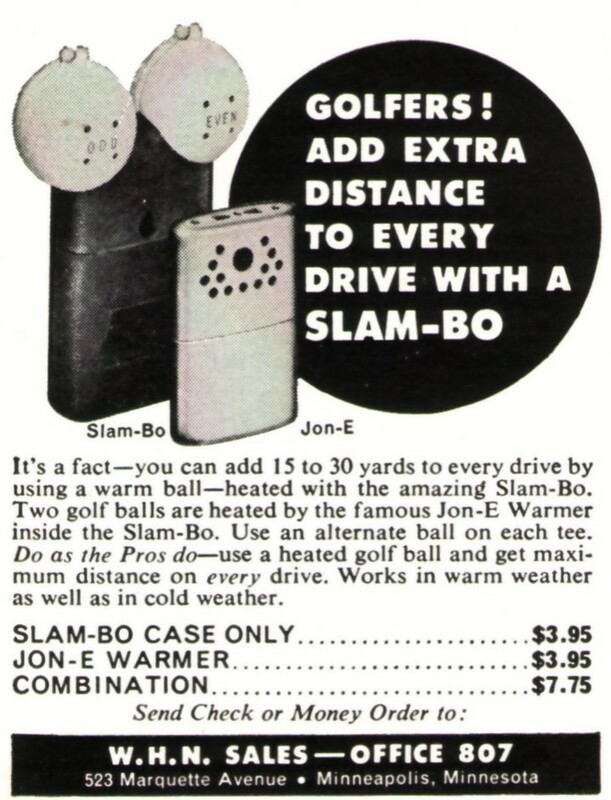 If so, Zippo makes a gizmo that looks a lot like the Jon-E Warmer. (You can buy one here.) 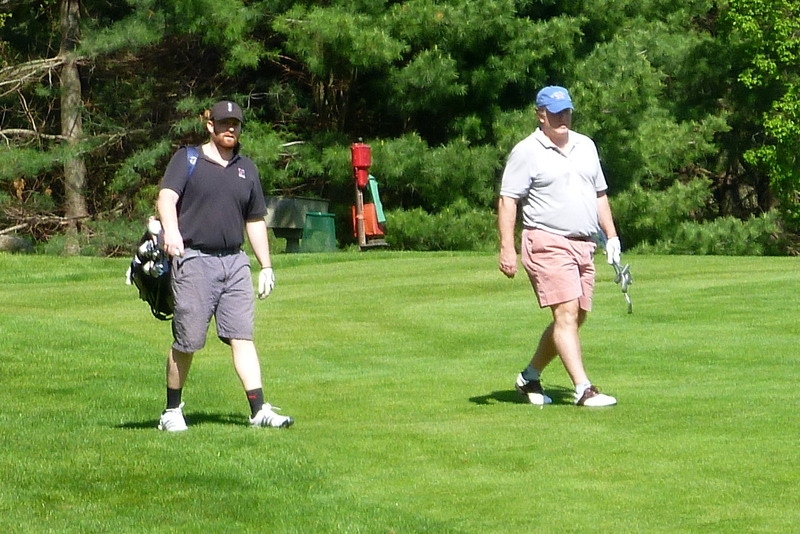 Gary, our superintendent, usually brings hand-warmers for everyone when we play in the winter. I don’t really care for them, although I did once play while wearing a back warmer. 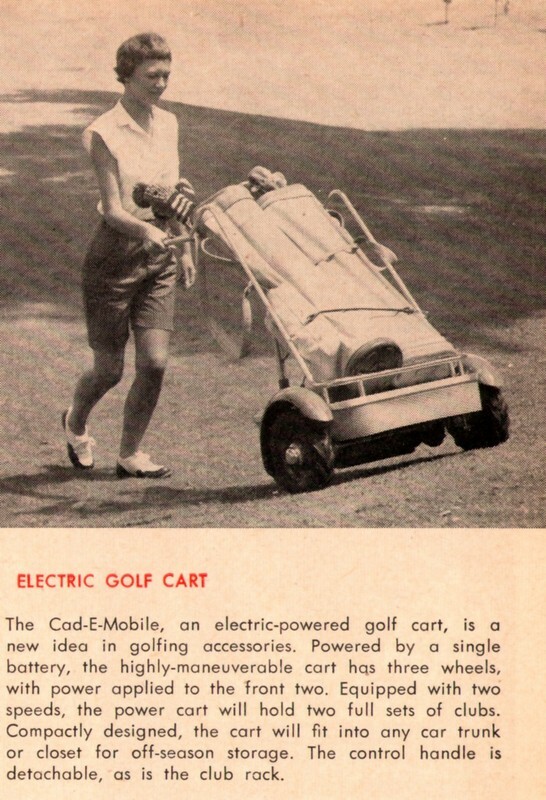 Note the handy “odd” and “even” designations, to prevent confusion on the tee. This Creature-form-the-Black-Lagoon glove is also from 1961, and also possibly illegal. The digital cluster on the right looks as though it’s about to divide into separate fingers—including, possibly, a sixth one. Is this the sort of thing Lance Armstrong was doing? 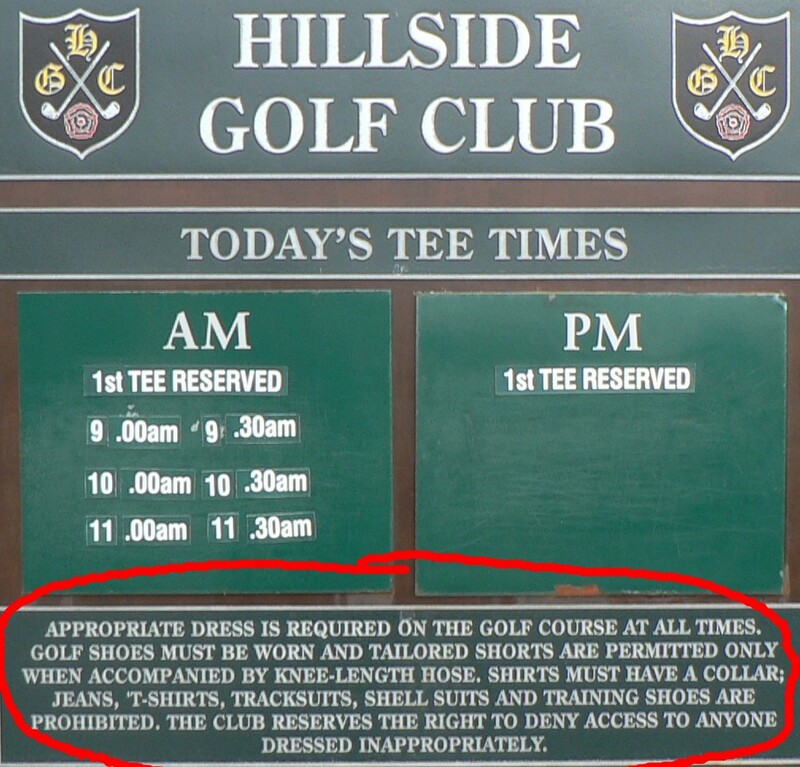 Also: why the emphasis on the twelfth hole? 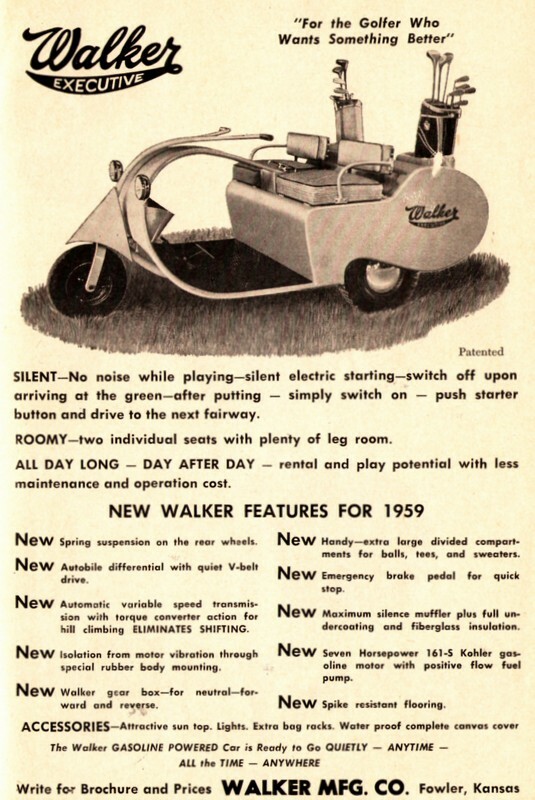 This device, from 1961, might actually be a partial solution to the dirty-pocket-rim problem, which I complained about over the summer. Maybe add a tee bandoleer and some magnetic ball markers? Still baffled about what to give (or ask for)? More soon. 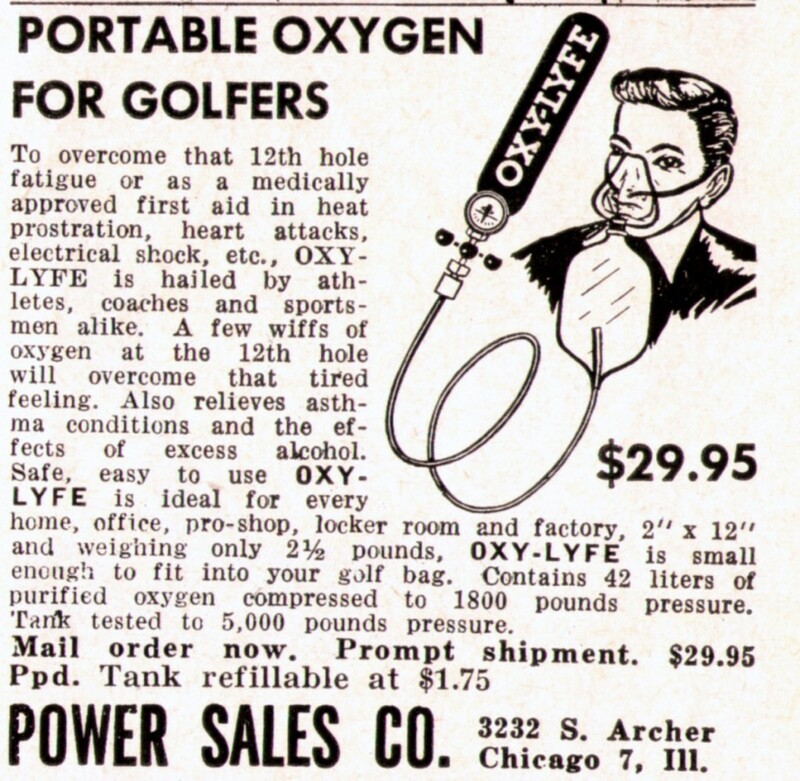 This item is from 1957, when golf, cocktail-drinking, and home refrigeration were all ascendant in the United States. U.S. Royal was a trade name of the United States Rubber Company, which renamed itself Uniroyal in 1961. 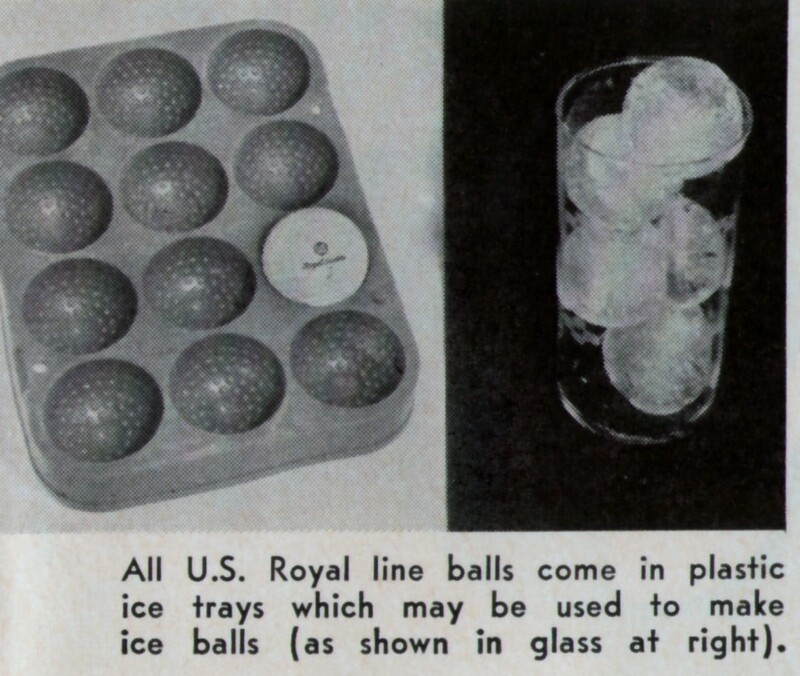 It no longer makes golf balls, although it may still make ice trays. 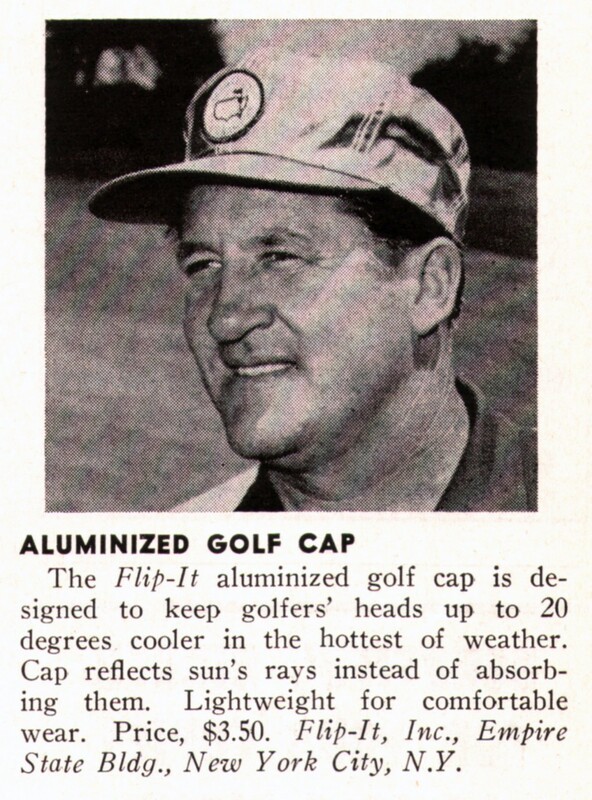 The reflective metallic golf hat, also from 1957, is an idea that never caught on, for unknown reasons. The hat was probably most useful in match play, since by standing in the right place and tilting your head you could temporarily blind your opponent. 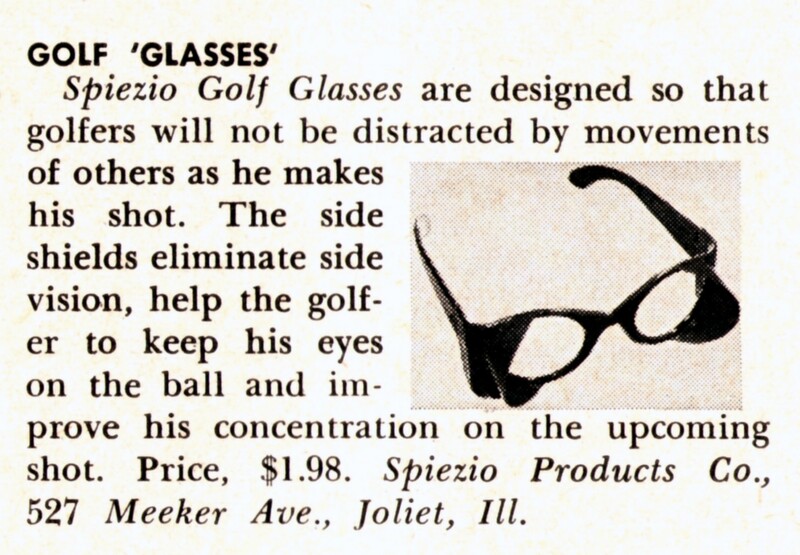 The logo notwithstanding, I don’t think anyone ever wore one in the Masters. Wehrmacht surplus? Somebody must have bought a load of these, because they were advertised all over, and not just in golf publications. 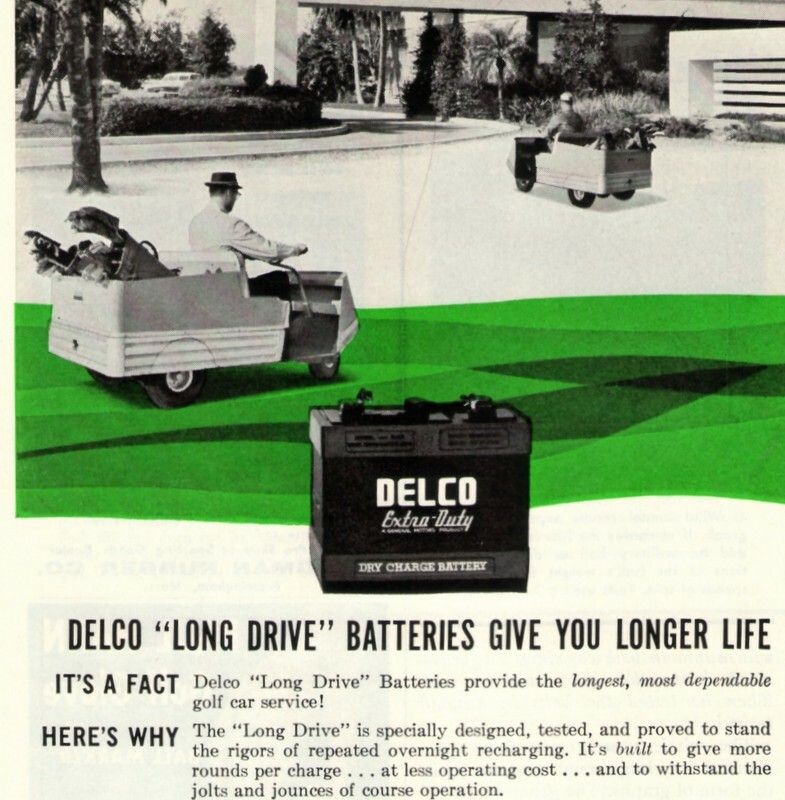 This ad is from 1960. 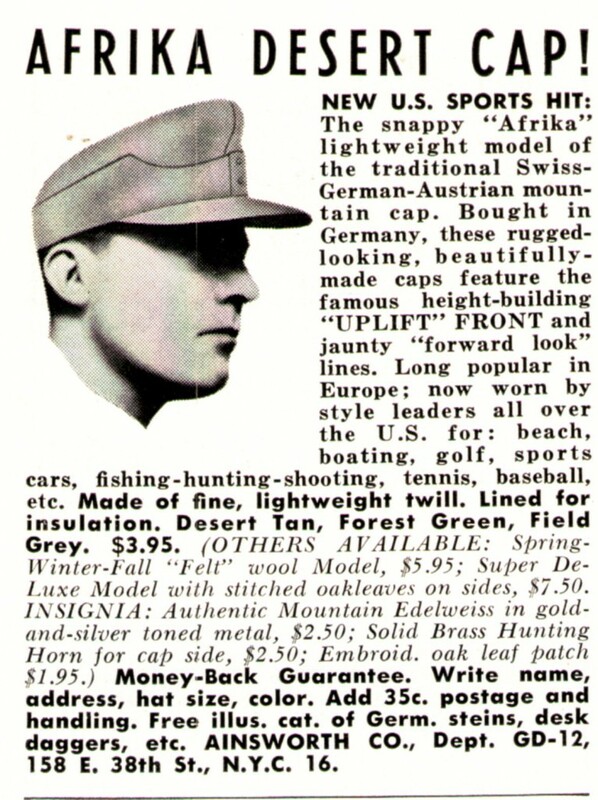 Hats like this are still available, although they’re of interest mainly to Third Reich fetishists. 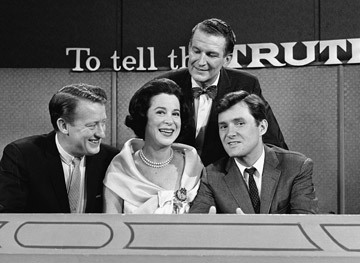 Also from 1960. 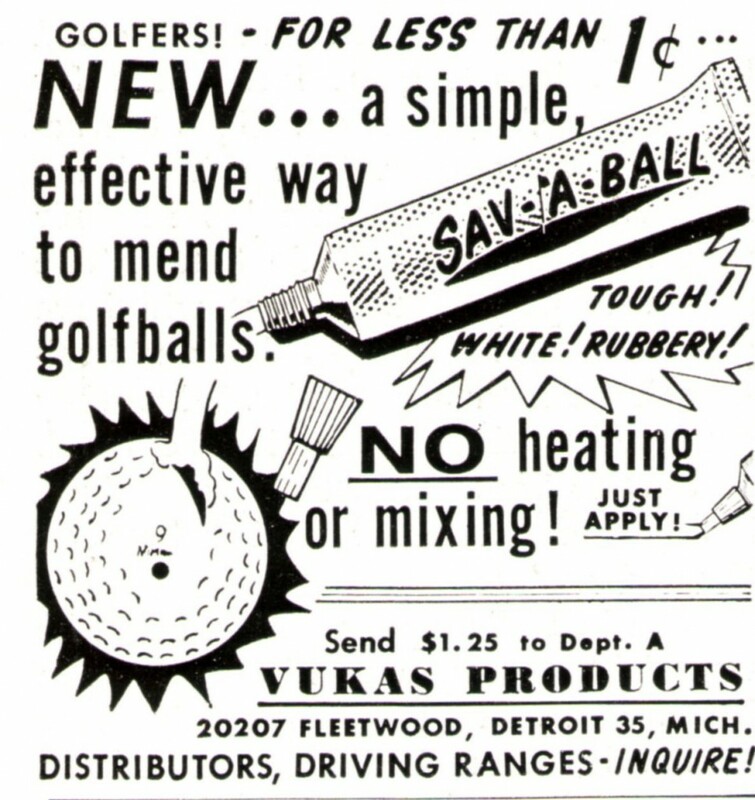 Golf ball repair is a concept that doesn’t really exist anymore. 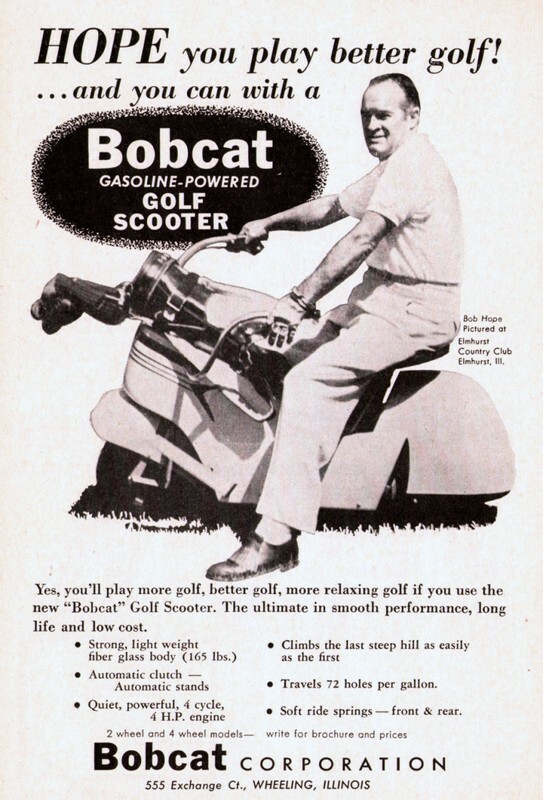 This ad is from 1958, but versions of it ran for several years. The price is per week, not per night, and it includes room, golf, meals, tips, and just about everything else. (Dove hunting may have been extra.) 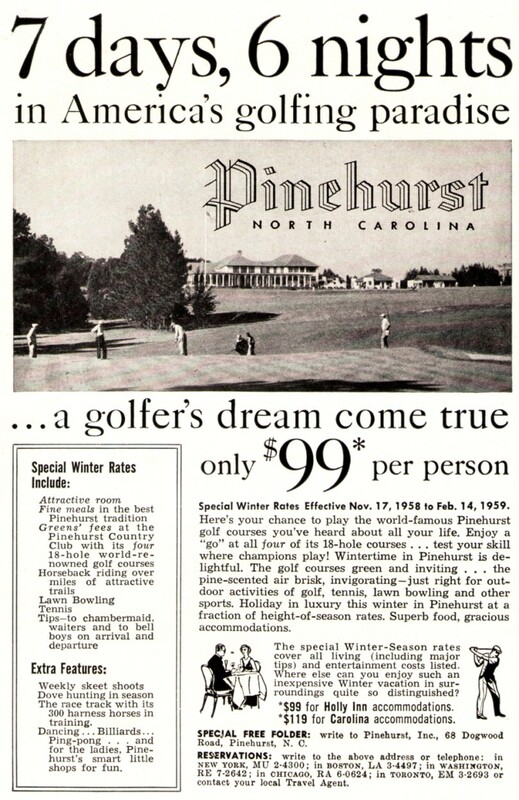 Today, you’d pay almost as much at Pinehurst for a dozen Pro V1s. Don’t see anything you want? More gift ideas soon.